This is the paperback edition of the six books published as ebooks (see below) in the ‘Twas the Night Before series. So starts the last day of an Old Year in Jocelyn Taver’s life. Over the next twelve months, she faces her twenty-sixth birthday, falling on Mother’s Day, at the same time as she wonders what happened to a certain officious lawman and a certain deserter father remembers her birthday after only fifteen years of neglect. An ex-boyfriend and the appearance of a complete stranger are not the only obstacles to disrupt her author’s launch, especially when that stranger is her next editing assignment. But this New Year’s isn’t all downhill. Nights Before national holidays bring more than big sale weekends for Joey-Jo, including all she ever wanted for Christmas. 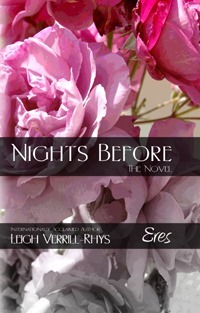 Nights Before: The Novel is also available at Barnes and Noble and on Amazon. For a reckless idealist a raptor’s lair is the safest haven. He’s a lawyer. He’s her boss. He’s the pterodactyl man she wants. She’s broken and can never give him the family he wants. She’s too good for him. She’s the answer to his prayers. He’s a monster to consider involving her in the mess he’s made of his life. David Gitano’s family believes she is using him. Emily Burdis’s family believes he is using her. Members of the Board want him to take the blame for a conspiracy that will destroy his career and he’s the kind of pterodactyl man who will do what it takes to protect his family. The conspirators want her to abandon him to his fate but she’s just as much a raptor as her lover when it comes to the family they have created together. A custody battle for his two-year old son is the ultimate weapon but even that fails when Emily employs her public relations training to stack the family court against David’s in-laws. All available on the iBookstore, Kobo, Amazon Kindle. ‘Tw as the Night Before Christmas Eve #6 (on the iBookstore): Christmas Past and Christmas Previous haven’t been all Jocelyn Tavers wished, but Christmas Present and Christmas Future are in capable hands – her own. But even the best laid plans have a way of meeting disaster head-on. No surprise that her ex has every intention of spoiling Christmas and any hope of a happy future. He doesn’t want her but he doesn’t want anyone else to want her either. A burst of wishful enthusiasm sinks her further into impersonating someone she’s never likely to be, especially if a certain law-abiding citizen isn’t in a generous frame of mind. Man-trouble doesn’t end with ex-boyfriends or those she’d most like to be new boyfriends. Better than holiday spirit, Santa has a special gift wrapped up, warmed up and ready to fulfill all her cherished desires but first she must come to grips with the foundations of any good relationship. ‘Twas the Night Before Veterans Day #5 (on the iBookstore): Months of job-hunting, land Jocelyn in the protective custody of a close friend and seeking the help of a French-speaking public servant whose absence has cracked her façade of laissez faire and nonchalance. Who would have thought a tow truck driver would be her rock in a hard place? Working a few days a week keeps her snazzy 4×4, Spike, from running out of gas and a meal on her table but can’t bring in enough to keep minutes on her cell phone when her former managing editor wants to contact her with a change of plans. Both of her least favorite authors have made demands and she can’t say no when her rent needs paying. 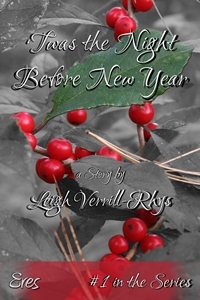 My most recent contemporary work is a novel published in installments, Nights Before, the first of which was published in December 2012, ‘Twas the Night Before New Year. I have written about this work in my post, “Writing Ambitions,” in which I explain the craziness of having characters roaming around in your head all day, no matter what you do. 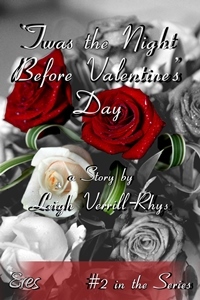 The second in the serial novel is ‘Twas the Night Before Valentine’s Day, in which the heroine, Jocelyn Tavers, explores the joys and sorrows of juggling a career, three unwise princes and an ex-boyfriend, while still coping with grief and a long-inflicted open wound. 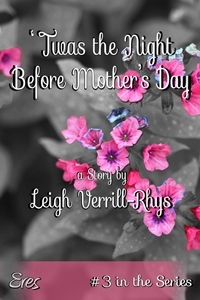 In the third story, ‘Twas the Night Before Mother’s Day, Jocelyn hasn’t had much luck with any of her potential boyfriends so far. That gaping hole in her life gets a severe reality-check when a dark stranger from her distant past makes a shock appearance just when she least needs to know. ‘Twas the Night Before Labor Day brings Jocelyn hard work, a joyful realization, job loss and the return of more than one unwelcome visitor. 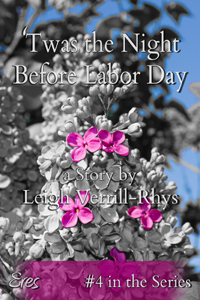 Scheduled for release in November, ‘Twas the Night Before Veteran’s Day, marks further upheavals in Jocelyn’s life. She’s in love for the first time, stalked and shocked. The final story in this novel by installments is ‘Twas the Night Before Christmas Eve to be released in December, one year after Nights Before #1. All of these books are or will be available at Amazon and on the iBookstore, as well as All Romance Ebooks and Smashwords. See Above: These are no longer available as separate ebooks. A sequel to Salsa Dancing with Pterodactyls, Part I, was released in March 2013. Because I so liked the title, this sequel is called Salsa Dancing with Pterodactyls, Part II! The themes of this novel are similar to those of Part I, strength of character, faith and trust, jealousy, familial love, following dreams, confronting evil. This is a darker part in the lives of Emily Burdis and David Gitano. Their love for each other faces many obstacles, not the least of which are religious beliefs. This is a sneak preview of the proposed cover. 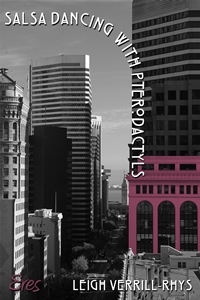 My second novel, Salsa Dancing with Pterodactyls, Part I, is set in the financial district of San Francisco. Salsa Dancing is a book I have written about for many years on this blog. My magnum opus as I called it in one post. I began writing this novel in 1995, when all my children were in full-time education and I couldn’t stop myself. In a short time, I had to set it aside and concentrate on earning a living. In spite of that, I never gave up the intent to finish and publish this book. Salsa Dancing has many themes: infertility, personal responsibility, inequality, prejudice, religious faith but principally, Salsa Dancing is about the most important personal characteristic – personal integrity. “To thine own self be true, thou canst not be false to any other.” (Paraphrasing Shakespeare). 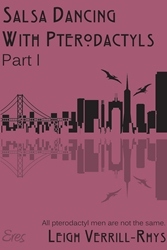 This novel is available on the iBookstore. While living in Wales, I was one of the founding members of women’s cooperative publishing group, Honno, which is now one of the most respected publishing houses in the country. Most of my work was as a Director but occasionally, I had the opportunity to offer my services as an editor. My first anthology of women’s autobiographical writing, On My Life, won an award in the Raymond Williams Community Publishing Awards. 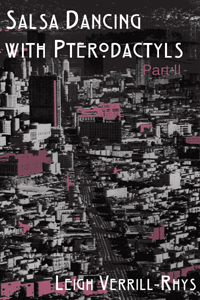 My second anthology, Parachutes and Petticoats, women’s autobiographical writings about their experiences during World War II, has now been reprinted a third time. And my Welsh language anthology about WWII, Iancs, Conshis a Spam, completed my commitment to the most wonderful generation of Welsh women in living memory. Part of my reason for this commitment to WWII is my mother’s story about her experiences here in the United States. 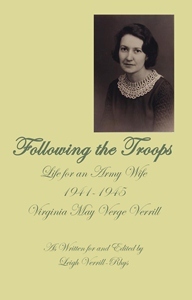 Following the Troops was published in the Fall of 2012, twenty years after Parachutes and Petticoats, and eight years after I had presented a copy to my mother, and members of my family, on her 90th birthday. This book is also available on the iBookstore. The above link will take you to the first page of my website and the Paypal link to purchase a signed copy of this book. You can also tell me how you would like the book inscribed. Please let me know your thoughts about Wait a Lonely Lifetime. You can write on my Facebook page, comment on this Blog page, send me a Tweet or write a review on Amazon. 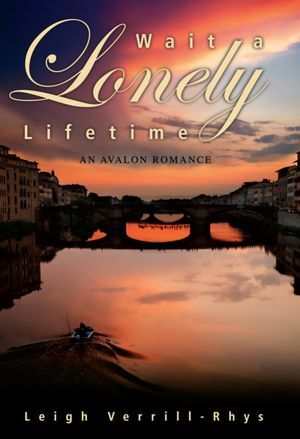 Since Wait a Lonely Lifetime was published by Avalon Books, the company was sold to Amazon. That had meant my debut novel novel is now available in digital format and as a paperback. If you are on your way to Florence (Firenze), you may find the novel is also an excellent tourist guide! I’m proud to promote this wonderful city in this way. I will see what I can do, Teresa. Thank you so much for your interest! Hi Leigh, I’m still hoping to read Virginia’s memoirs one day when it’s in a format I can use! Is there a chance you could send a printed copy back to Wales with one of your offspring in April? Is Facebook the best way to send an e-mail message? Hello, and thank you for the link. Your photographs are stunning. I did try to place this comment on your blog site but, after typing nonsense words endlessly to prove I wasn’t a robot, I came back here to say: Superb photographs, though I’ve never been a fan of Maine winters, too much snow down the back of my snowsuit as a child. on March 17, 2012 at 5:31 PM | Reply ShannonM. They often do! Good company. Good spirits. I’m delighted we could share it with you and your man. on March 11, 2012 at 3:14 PM | Reply Shannon M. YES!!! Great day all around! See you next week for 6 Nations finale! Thank you for a fabulous morning. Rugby all around. And wonderful to share Wales’s Grand Slam victory with you! So great to see you and have both our teams win as well as to have the opportunity to hear a librarian and a bookseller. Heaven in Berkeley. Shannon! So nice to see you here. I’m looking forward to tomorrow – Rugby and Librarians! on February 14, 2012 at 5:55 PM | Reply Shannon M.
It was great meeting you at SFA-RWA last weekend! Drop a line so we can catch some rugby together:) Shannon M.
Thank you, Krista. If you’d like, you can like my Facebook page or subscribe to this blog. Much appreciated. You have a lovely blog! Thanks so much for visiting mine. Is there a way to follow you? Appreciate your comments about romance and writing. I have a new novel out about life in psychiatric hospital, Memoirs From the Asylum. Hope that doesn’t make me fit to live with nuts. Seriously, I’m always looking for blogs whose authors want me to guest as a way to spread my name. Let me know at Ken_Weene@Cox.net if you’d be interested. Here is a link to a trailer for the new book.